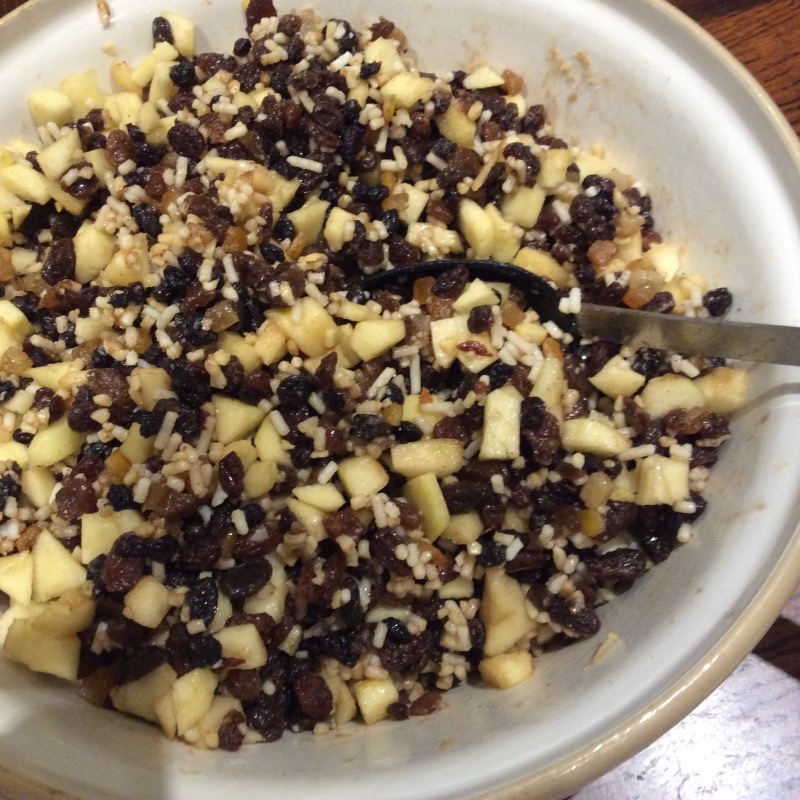 Well Mrs Patmore would be proud of me – even dewy eyed – as I get the mincemeat mix ready now to enjoy later. I may not have the residents of Downton to feed although it sometimes seems like it. 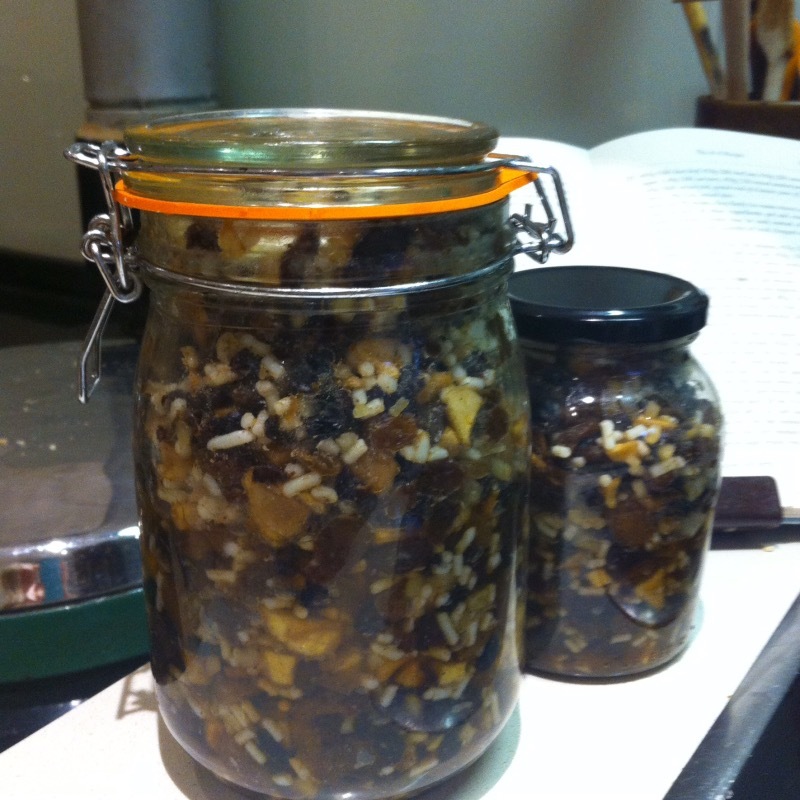 I chose the simplest of Beryl’s six mincemeat recipes just substituting vegetarian suet so that it can be enjoyed by all the family and is equally acceptable if I decide to give some away as a gift. It makes about 3. 5Kilo (8lb) of mincemeat and I aim to allow it to mature for at least two weeks – even if my aunt suggests two months! and it can store for months. Beryl also has a recipe for immediate use. 910g (2lb) apples, peeled, cored and chopped, 450g (1lb) vegetarian or meat suet, 910g (2lb) dark brown sugar, 450g (1lb) each of raisins, sultanas and currants, 225g (1/2 lb) finely chopped candied peel, 113g (1/4lb) balanced chopped almonds, 28g (1oz ) mixed spice, brandy to moisten. 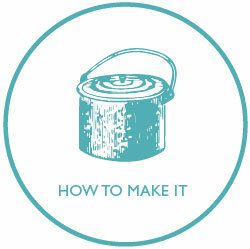 Chop all ingredients, mix well and pack into large sterilized jars . Large or small open mincemeat open of lattice topped flans. 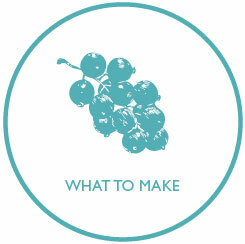 For the topping – 113g (1/4lb) margarine, 113g (1/4lb) rolled oats,225g (1/2lb) flour, 84g (3oz) soft brown sugar. To make the topping melt the margarine in a pan and stir in the sugar to dissolve. 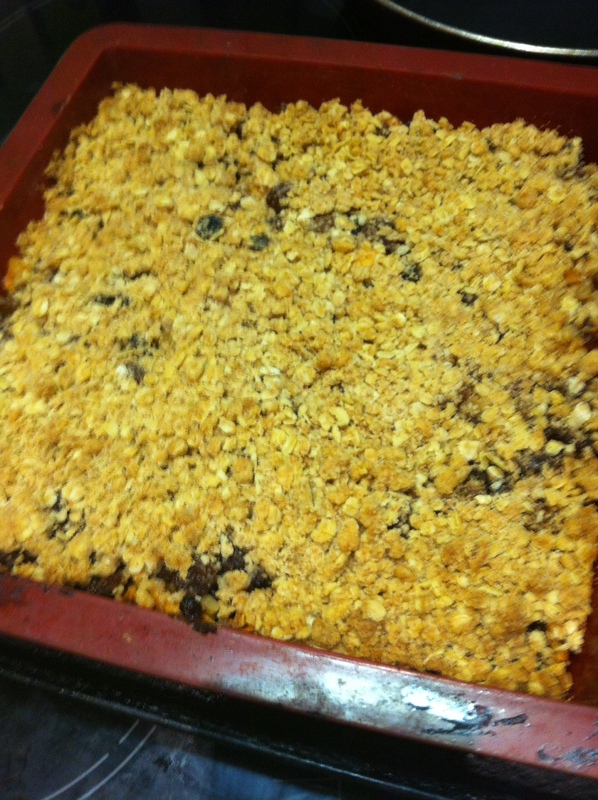 Remove from heat and mix in the flour and and oats. Roll out pastry and finely line a 8inch square or equivalent sized baking tin and blind bake for 15 mins (reg 5) Allow to cool. 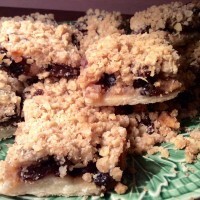 Remove from oven and allow to cool and then cut into sixteen squares. Wait until they are absolutely cold before removing them from the baking tin. The family say they are rather like the slices they sell in Pret a Manger. And of course mine is homemade. Peel citrus fruit, including as much of the pith as possible. Slice peels into approximately 1/4-inch pieces. Place prepared citrus peel in a sauce pan and just cover with water. Bring to a boil and simmer for ten minutes. 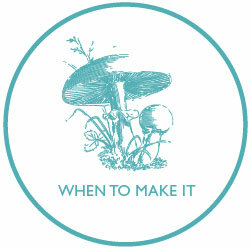 Drain and repeat, this time reserving 1/2 cup of the simmering liquid before draining. Return boiled peel, 1/2 cup reserved liquid, 1/2 cup fresh water, and 1 cup sugar to sauce pan and stir to dissolve sugar while bringing to a boil. Remove from heat, cover, and let sit overnight (mine sat about 18 hours). The following day, add an additional 1/2 cup sugar and bring to a boil. Simmer for 15 minutes and then drain citrus peel thoroughly.